What is it like to attend a food truck rally? What's it like to attend a food truck rally? Below we’ll cover everything you need to know to enjoy your visit! Come prepared: While most trucks accept credit and debit cards, we recommend bringing some cash in case it's needed for parking, or in the rare event that technology fails us and the trucks are not able to accept plastic (we will admit there are only a few events nowadays where trucks aren't allowed to accept debit and credit cards). Check which food trucks will be on site in advance. If you want to plan ahead, check our events calendar for alisting of food trucks that will be on site at that particular event. You can even peruse their sample menu to get an idea of what dishes you would like to try, and pricing prior to arrival. (Menus at each event are subject to change!)outdoors. Depending on the event, you will be standing and milling about where the trucks are parked, seated (potentially on grass) or at tables. Dress comfortably and appropriately for the weather and the venue, and during the summer it may help to bring a hat and sunscreen. If you know the rally is taking place in a park, such as our monthly downtown Lakeland Rally, feel free to bring a beach chair or blanket to enjoy your meal picnic-style. While most events will continue rain or shine, the food trucks are almost always parked. more than just food! Whether it be live music, a 5k, a Tampa Bay Lightning watch party, a fundraiser for a school, the food truck events are set up for you to be entertained and to enjoy yourself. Your best bet is to plan on attending events that align with your interests. What is provided? The trucks sell food and drinks, and also provide cutlery and napkins for you to enjoy your food. Trash cans will be placed strategically around the event and we ask that you use them to keep the event site tidy. Most importantly, have fun! Food truck events are great for bringing groups of friends, as there is ample parking, room for you to mingle and spread out and share and sample different types of food. They are a fun alternative to traditional restaurant get-togethers where you can only speak to those seated closest to you and are limited to one menu. A lot of events hosted are also family-friendly! What better way to enjoy some family time, while sampling great food in a casual atmosphere? One of the awesome benefits to feeding your family at a food truck rally is being able to come and go as you please - no getting stuck waiting for your check or infringing on naptime! Take photos! Tampa Bay Food Trucks as well as the food trucks love to see pictures of customers enjoying themselves and their food. 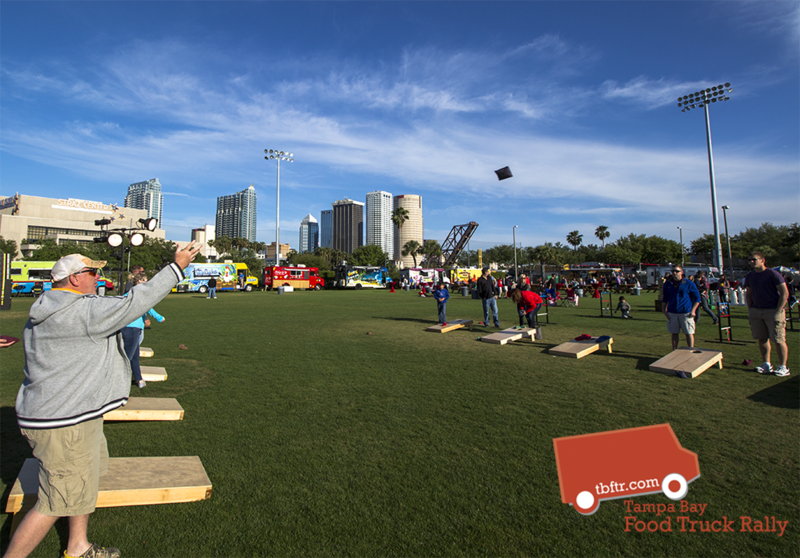 You can tweet or post to Instagram and tag us @tbftr and @tampabayfoodtrucks. We periodically select photos to be featured on our Facebook page as well. Did we miss anything? We’re happy to answer any questions you may have regarding upcoming events or rallies in general. We hope to see you very soon!